Ms. Banerjee holds an M. Sc. in Botany and Forestry from Vidyasagar University and a P. G. Diploma in Bioinformatics from Jadavpur University. She was a research fellow under World Wide Fund for Nature, India (WWF-India). She has worked with the National Afforestation and Eco Development Board, Jadavpur University, and is Project Consultant of the Medicinal Plant Garden project under Vishwa Bharati University. 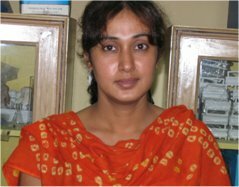 Her area of interest is ethnomedicine and she is involved in the development of a medicinal plant database of West Bengal, with specific focus on 3D structures of active ingredients. She is also engaged in developing a bioinformatics software suite with a graphical interface, targeted to sequence analysis and structural biology.